The recent, unprecedented upsurge in attacks on retail businesses makes it clear that cyber criminals have now turned more of their attention – and formidable skills – to cashing in on the sector’s rich cache of confidential data. According to MessageLabs, the number of attacks that specifically targeted the retail sector jumped to 516 in just one month during Q4 2010, compared to the earlier average of 7 attacks per month for much of that same year. It also marked the first time in recent years that the retail sector became the focus of a major targeted attack campaign. 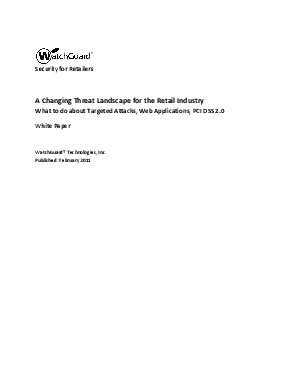 This white paper examines five steps to better security that today's retail businesses can't afford to ignore on their networks - from application control to data loss prevention - to ensure business continuity and PCI DSS compliance.